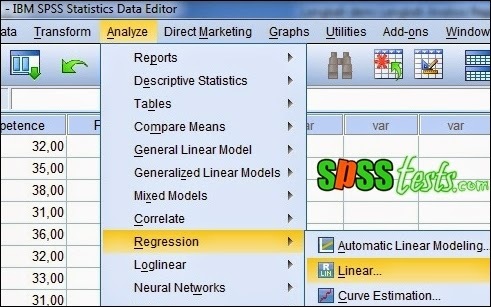 Step by Step Simple Linear Regression Analysis Using SPSS | Regression analysis to determine the effect between the variables studied. Variables that affect so called independent variables, while the variable that is affected is called the dependent variable. 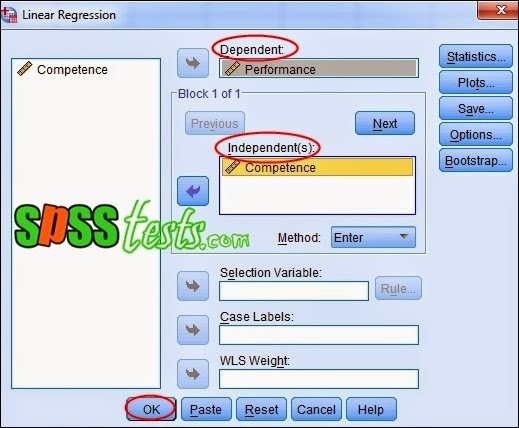 The independent variable is marked with the letter X, while the dependent variable is marked with the letter Y.
Regression analysis based on the number of independent variables divided into two, namely the simple linear regression analysis and multiple linear regression analysis. Simple linear regression analysis to determine the effect of the independent variables on the dependent variable. A company manager wants to know whether there is an influence on Employee Performance Competence. In this case the competence is the independent variable, while the performance is the dependent variable. 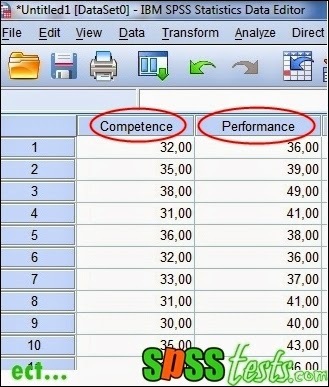 Furthermore, the manager of Competency and Performance collect data from a sample of 40 employees. 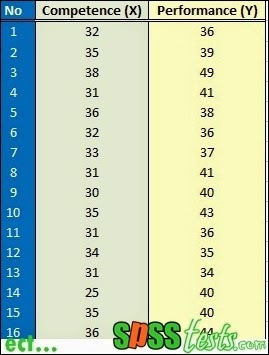 The research data as shown below. 1. Turn on the SPSS program and select the Variable View. Furthermore, definitions study variables so that the results fit the picture below. 2. Then, click the Data View and enter the data Competency and Performance. In this section display the value of R = 0.692 and the coefficient of determination (Rsquare) amounted to 0,478. This suggests the notion that performance (Y) is influenced by 47.8% by Competence (X), while the rest (100% -47.8% = 52.2%) is explained by other causes. In this section displayed a significance value of 0.000 <0.05, then the appropriate basis for decision making in the regression analysis can be concluded that the Competence significant effect on employee performance. Thus, increasing the competence of a person it will also improve performance. 0 Response to "Step by Step Simple Linear Regression Analysis Using SPSS"